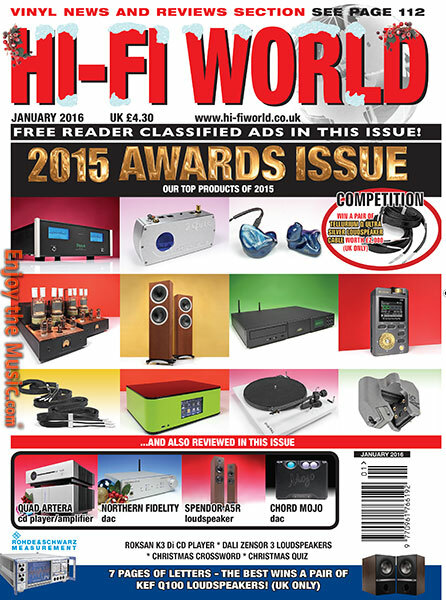 Here's How We Tested Products For This Issue: Chord Mojo And Northern Fidelity DACs. Our Reviews Have Unique Insight. Here are the truly outstanding products of 2015, those with a special something. 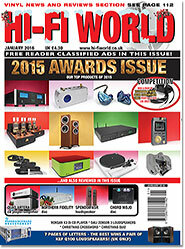 They will all receive Hi-Fi World's prestigious globe award. Read the original reviews of this year's award winning products to get the full picture. The team come up with their Christmas 2015 wish lists. Leave this one lying around where the family will see it. Then keep fingers crossed! Crossword lover Jon Myles sorts out this little tester for us all, to ponder upon whilst the turkey sizzles. Think you know about hi-fi and music? Try our annual Christmas quiz to test your knowledge. Jon Myles listens to Dali Zensor stand mount loudspeakers. Spendor's new mini floorstanders entertain Jon Myles. Chord's new Mojo portable DAC is given a shakedown by Noel Keywood and Jon Myles. With Bluetooth, gets Jon Myles attention. Roksan's CD player/DAC gets the close attention of martin pipe. This month's series of music-related books: Paul Rigby takes a look at two new works on the Beatles. There's nothing like a test record to sort out your turntable. Noel Keywood reviews a new one from Clearaudio. Simple Minds: Real To Real Cacophony.